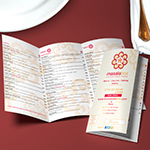 Full color EDDM glossy restaurant menu printing is available at low cost. Our menu printing company is famous for providing professional menu designing services. The creative menu represents the atmosphere of your restaurant and orovide the information about your food. Full color menu printing lets you show photographs of your dishes to entice the appetites of your diners. The printing quality will attract your customers and they will come inside to see your presentation. You do not have to worry about anything, just let us know all your needs and demands and we will do the rest of the work. We provide cheap placemat printing at low cost for your restaurants. Our affordable cheap menu printing also has access to double sided menu printing in all fashions, styles and traditions. For rush discount menu printing, customize your online custom design menus and print even faster for a more impressive digital menu printing in high fashion. This is a high quality, thick paper stock that is excellent for projects. Full bodied paper perfect for folding, coated with a glossy finish for better reflectivity and durability. Well suited for Menus, brochures, catalogs and flyers. 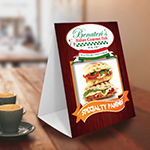 A key element of restaurant marketing is focusing on menu printing. A profitable menu comes through item selection, graphic design, and knowing how to direct customers to the menu items you want them to choose. A menu has to be more than just a list of your items and prices. In fact, a menu must be a full-blown advertisement designed to increase sales and generate as many walk-ins, phone calls, and web orders as possible. There are also very effective tools available to help boost the number of customers that visit you for a meal. When designing a menu, there are other things to consider than just the items and prices. Emphasize popular choices and what you are known for. Add pictures. After all, most people eat with their eyes first. By adding pictures, you help the customer visualize what you have to offer. Avoid letting the menu look like a price list. Whether on the cover or in an insert, it is important to include special offers, promotions and discounts. This will help drive sales and make customers want to return. Organize your menu into groups of similar items. For example, there should be a section for sandwiches, another for salads, and another dedicated to pizzas. We use our printing precision printing technology with each and every 2-or 4-color menu printing in different styles with a new look. Our expertise provides not only menu printing but also superior and standard vinyl lettering printing. Our advanced menu printing company gives you premier service for all printing products. You are sure to have customized menu printing effortlessly and quickly. 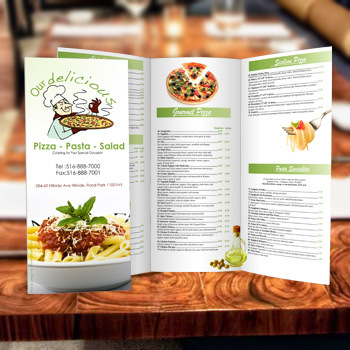 When quality menu printing is done in the right way, it brings incredible business to the owners, as it displays the presentation of your restaurant menu. Our New York Menu printing guarantee is that your customers will equate the quality of your food with the quality of menu printing. 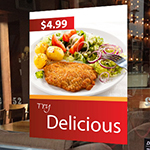 We happily announce that we also have special rates for our customers in Long Island for restaurant backlit display signs. Our expertise makes the best artistic menus which will definitely attract your customers. You can make your restaurant menu printing work for you by drawing your customers' gaze to your most popular and profitable items. The right menu design can boost your sales by up to ten percent; that means a big difference in the success of your food service company. Use descriptive, well-conceived titles. Place the more profitable menu items in certain spots. People are more likely to pick the first or last menu item in a section. Place your most popular and profitable items in these menu spots and watch them really move. Page positioning is everything. On a tri-fold menu, people tend to look at the center panel first. In two-page menu printing, people tend to look at the top right hand side. Put your high profit items in those spots to help increase your sales. Depending on the size and number of items on your menu, you can highlight every seven to ten items. Bold lettering can work to highlight special items, too. Advertise your low fat or heart healthy items. People are trying to be more health conscious these days. Attract attention to your healthy menu items with special icons OR create a special menu section just for the health nuts. Do not be shy about mentioning calories or fat content to help your customers make a smart choice. 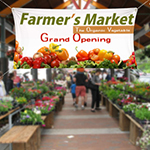 Advertise your most popular items with a miniature company logo. Use your logo to draw the eye to your house specials. If your specials have your logo nearby, your customers will know that this is the only restaurant in town to serve those particular items. Remember, your menu printing is also a form of branding and advertising get your name and logo on every page. My menus helped me to impress the clients. I am really impressed by the quality of your products! Product: Restaurant Menus, 8.5" X 11", 8.5" X 14", 11" X 17"
* Same Day orders must be approved by 10am EST. All other orders must be approved by 1pm EST. Any orders not approved by these deadlines will be deemed to be approved the next business day.